When Capcom took the stage, many were expecting to see something regarding Monster Hunter; however, we received something entirely unexpected instead. The major studio is launching a new Dragon's Dogma, called Deep Down, and showed us a snazzy new trailer right off the bat. Only time will tell if this succeeds, but Capcom could sure use a good title right now to help curry favor with its somewhat disappointed fanbase. InFamous, by Sly Cooper studio Sucker Punch, is one of Sony's most popular exclusives in recent years; after the events of InFamous 2, many were curious if we'd see another installment in the series. Well, today those questions were answered, with a trailer showing us a new protagonist and a decidedly more political slant. Looks like Second Son is going to feature a lot of destruction; something that gamers can't get enough of. We saw a new trailer for Watch Dogs on the PS4 tonight, and this one was definitely more action-oriented. We saw a chase scene and a lot of parkour, and it was very, very pretty. It's shaping up to be a Cyber-Assassin's Creed in Chicago, and if you're a fan of Ubisoft's other titles this just might be one of their most tightly crafted. 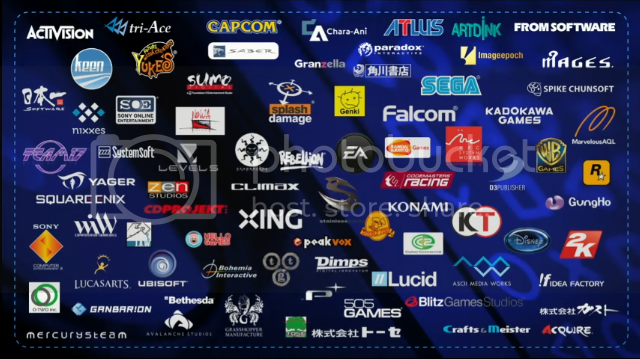 Above is the list of developers working on games for the PS4; basically every big-time developer is seen, along with many smaller companies. Not much in the way of exclusive developers, but it's still a massive list, and we'll be seeing a lot of games coming Sony's way at this rate. What you see above is the first character model we've seen fully take advantage of the graphical and lighting power the PS4 has to offer. What's even crazier is to see it in motion; there are so many subtle movements in the wrinkles of the face, I can't wait to see what Quantic Dream can do with their next title and this technology.